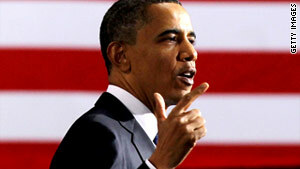 Multiple sources tell CNN that President Obama could announce his re-election campaign as early as Monday. Washington (CNN) -- President Barack Obama plans to send supporters a text or e-mail message announcing his intention to run for re-election, multiple Democratic sources tell CNN. The message, which might include a video that would be posted online as well, could come as early as Monday morning. The sources say Obama's team also hopes to file papers with the Federal Election Commission on Monday to launch his 2012 re-election campaign. The timing of the announcement and the filing could change depending on outside events. The White House is closely watching negotiations on Capitol Hill over the 2011 spending bill, which must be resolved this week to avoid a government shutdown. This would come more than a week before the president hosts his first re-election fundraiser in Chicago on April 14. These Democrats say no public event is planned because the White House wants to downplay the announcement and minimize the political distraction. The president is making his campaign official slightly earlier than is typical for an incumbent so he can get a jump on fund-raising in a season that's likely to shatter all records. Obama's team has been asking campaign bundlers to raise $350,000 each, no easy task since campaign finance laws limit gifts to $2,500 per donor. Two sources tell CNN the campaign team hopes that in total their bundlers will raise $500 million, leaving the campaign to raise another $500 million and amass a record-breaking $1 billion war chest. According to these sources, the president has made calls to top donors and conference calls are planned this week to supporters and key Democratic groups. Vice President Joe Biden is already planning to be in New Hampshire Monday and will meet with key supporters in that crucial early voting state. For the past few weeks, Jim Messina, who will manage the campaign, and Patrick Gaspard, executive director of the DNC, have been flying around the country meeting with frustrated donors working to get them re-engaged. So far no Republican contenders have formally announced. But these days the likely Republican presidential contenders are making endless visits to key early voting states and meeting with supporters across the country. One top Democrat says, "The Republicans are out there day in and day out beating up on the president -- they're basically running without filing. So to say we're going first isn't totally fair." This person adds, "No one wants to start running now. The president is engaged in the country, this is about getting (campaign) staff up and running."